Don Ernst helped establish his firm in San Luis Obispo in 1980. He is a third generation San Luis Obispo County native. He partnered with Ray Mattison, and they launched the firm Ernst and Mattison. Ernst and Mattison became a name known throughout San Luis Obispo County and the State of California for trial excellence. In 1990, Don founded the Central Coast Trial Lawyers Association and was the first president. Don Ernst served as the San Luis Obispo County Bar President in 2002 and 2003. During his term, he founded the county’s first Lawyers Referral and Information Service. The Lawyer Referral and Information Service, called LRIS, helps the average person identify their specific legal problem, and get them to the right attorney. In addition to the corporate formation of the LIRS, his office provided the office space, computers and administrative services to get the LRIS operational. He served on the board of directors for years and still participates in the LRIS today. Don has lectured regularly on both a local and state level since 1990, speaking on topics ranging from ethics, workers compensation third party liens, general damages, electronic discovery, summary judgments, selecting juries, trying cases in conservative jurisdictions, opening statments, and the nuts and bolts of trials. 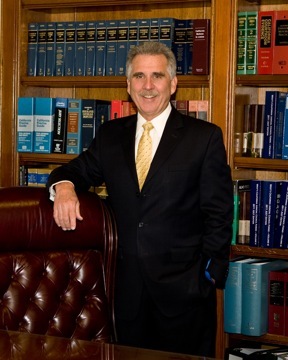 He has lectured for CAOC across the state and most recently at the annual CAOC convention in November 2011 on the presentation of general damages, and on January 31, 2012 wrote and presented a webinar on Legal Ethics and the Plaintiff’s practice. The firm always specialized in personal injury and insurance law, but Don Ernst quickly became recognized as a trial lawyer. Don Ernst has taken more than 100 cases to verdict. This history demonstrates the how he has effectively providing effective representation to accident victims and insurance consumers. In 2008, Don Ernst became the President of the Trial Lawyers in California, an organization called Consumer Attorneys of California. With over 350 million in verdicts and settlements for his clients, Don Ernst has made a significant impact throughout his career. Testament to this longstanding trial success is not only the largest plaintiffs’ personal injury award in San Luis Obispo County, but recognition in 2011 as a statewide finalist for trial lawyer of the year for the Consumer Attorneys of California. Don Ernst helped lead the law firm of Ernst and Mattison from 1980 until 2010. The Ernst Law Group arose in 2010 when Don and Ray parted on excellent terms. The firm became known as the Ernst Law Group, and continues the tradition of excellence established back in 1980.